Rumors have been circulating that the NVIDIA Tegra 2's inability to work well on Verizon's 4G LTE network caused the scrapping of the original Motorola DROID Bionic, which is expected to be released later this year as a completely different phone than originally planned. The same reasoning is behind the speculation that the inability of the Tegra 2 CPU to mesh with Verizon's 4G pipelines caused the LTE update to the Motorola XOOM to happen just now, a little late, as we reported yesterday. Like an angry parent, upset that his/her kid is the subject of some vindictive rumors that he can't get along with anyone, NVIDIA stood up for its product and said that the Tegra chip has no compatibility issues with LTE. The chip manufacturer brought up the Samsung Galaxy Tab 10.1 4G LTE tablet as an example of how Tegra and LTE play nicely with each other. 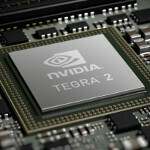 According to NVIDIA, there is nothing unique about LTE that would prevent Tegra 2 chips from working on it. Now that NVIDIA has cleared this up, perhaps a play date between the little tykes can be worked out. And at the same time, if Motorola would reveal the reason for the ole' switcheroo with the DROID Bionic, it could stop another vicious rumor from starting. Yes maybe now there is no issue, because they have had all this time to fix the problem. There may be more than meets the eye to this supposed NVIDIA/LTE incompatibility issue! It just seems fishy that now NVIDIA is speaking up, but not then when the issue first came up. This is stupid. No evidence, no sell. words are words no one listens too. If the Bionic comes with an OMAP 4....somethings up. Might not be related to LTE but Moto didnt just wake up one day and say "Hey, lets take out Tegra 2 and put another chip in our new phone this year!!" I wish ATI would jump in and make a phone with its own cpu/gpu , oh and amd that way everyone has their hand into Android. Now that would deff be a HUGE PROBLEM WITH FRAGMENTATION . Think I'm lying, look the apps designed only for nvidia phones, every manufacture wants their own app store and its a hug problem for any consumer. Oh and before anyone says anything about me hating Android, I'm a die hard HTC fan buying the Evo 3d. Well since you missed the news there is no more ATI. AMD bought them a few years and it's all AMD now. ATI did have it's own mobile gpu. they sold it. Today you know it as the Adreno line. This is starting to sound like a game of he said, she said. The seem to be problems with LTE handsets. The problems also seem to be occurring on LTE handsets with the Tegra 2 chipset. If other handsets without the Tegra 2 chipset don't have problems with LTE, it is going to be pretty hard to deny a linkage. Best to get out in front of the issue and get it sorted out. Speaking of which, now that the new Bionic has surfaced I guess any issues they had were, hopefully, wiped out. There were issues for sure though. No new tech will come out clean the first time around. So... when's the Droid Bionic coming out?? Im so excited! Check out Bionic news at\ www.verizonbionic.com !